For the past couple of weeks I have been branching out for a bit from LOTRO mainly from a lack of dedicated time. Not that I don’t have time available but that time is frequently and without warning interrupted which makes it very hard to do some of the things I enjoy in LOTRO, like raiding and group content. Because of this I’ve been shifting a bit from my normal play style in LOTRO to some other avenues. This has also been part of the reason for a lack of activity here as I just haven’t had all that much to write about. But for now this just feels like a little bump in the road. Outside of LOTRO I have been checking out a few other games as well. I’ve pretty much stopped playing Dragon Age as Awakenings seems to have lost its luster for me. I did enjoy it, but it doesn’t have nearly the same re-playability as Origins did. It certainly is replayable, but after the second time I just wasn’t that motivated, unlike the 5 times I went through Origins 🙂 Maybe that’s just because there are enough similarities that I don’t distinguish between the two. But certainly if you haven’t checked Awakenings out I do recommend it as the new skills and abilities are LOTS of fun. Another single player game that I’ve been playing off and on has been Mount and Blade. I’ve talked about Mount and Blade before and it is getting more press now that they’ve released Warband. I’ve downloaded Warband and have checked it out a little bit but I’m still on the trial version so I haven’t made it all that far. The graphics updates are great and they’ve redone the map completely such that it seems much more conflict centric. There are a number of other tweaks with romances and NPC relationships and the like that sound really intriguing but I have yet to see them. I still haven’t gotten quite used to the new swinging animations so my horseback attacks are pretty bad at the moment. I’m still on the fence about if there are enough differences between Warband and the original to warrant me buying the new version as I think the biggest new feature is a multiplayer aspect which while intriguing, doesn’t interest me at all. The final game I’ve been playing lately has been Age of Conan. I tried it out a little bit when they first launched and just couldn’t get into it. I will admit that I didn’t play all that much as I just couldn’t get the hang of the combat system. But when they announced the revamp of their trial system to allow full access to the starter zone for as long as you want I figured it would be a good time to check it out again. Plus the upcoming patches and expansions are interesting enough that I wanted to check things out. So far I’ve rolled 4 different toons, 2 of the heavy armor classes (Dark Templar and Conqueror), a ranger, and a mage type (Herald of Xotli). I haven’t done much with the Conqueror yet (the rest are at least level 13), but aside from the ranger the other 2 are quite different from the typical classes from other games I’ve played. The Dark Templar is a sword and board tank type that also can use dark magic to de-buff and leach life off of enemies. So in some ways it does mimic the play of the Warden, although with a drastically different back-story 😉 The Herald of Xolti (HoX) is a fire-based mage that also uses two handed weapons – which to me sounded like an interesting concept. The HoX does have some good absorption buffs which mitigates their cloth armor restriction so in that way they’re also somewhat analogous to Wardens in LOTRO. For all of these, I’ve mainly been focusing on following the individual epic class lines which are solo based. I’ve had to do a little grinding to get to the level requirements, but for the most part it hasn’t been bad at all. 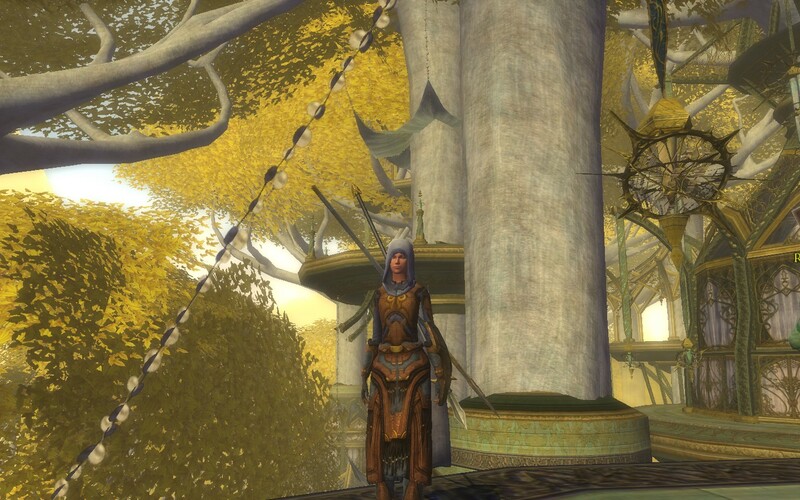 Based on my initial experiences, I am actually tempted to pick up AoC to scratch my PvP itch as it certainly is much more prevalent and rewarding then PvMP in LOTRO. The graphics in AoC are really impressive and I enjoy the feel of the area only slightly less then I like things in LOTRO. It has taken me a bit to get used to the combat system but now I really do enjoy it. The biggest thing that got me was the targeting system – you don’t have to target a mob to hit it (such that you can get inadvertent AoEs) but there is an auto-face standard that I haven’t figured out how to turn off such that if I forget to target the mob in front of me I’ll keep spinning around to some other mob that I might have tabbed to. AoC also has a combo system that reminds me of the Warden gambits but AoC has a visual prompt of what the next builder is supposed to be such that there’s not the same memorization requirement Wardens have. AoC also has a nifty way of handling your class epic line in that you’re taken to a Night-time instance that is single player. So all of your epics are done in that fashion at night, and if you want to join other folks you need to travel back to the day-time. So far I enjoy that system, but I’m not sure how it works going forward. Another enjoyable aspect of the story line is how the different stories play off each-other in that you’ll hear about other people in one class story and then actually get to play that part in another story. I didn’t realize they did this at all until I was reading the quest and realized “hey, that was my ranger doing that” which does make me want to roll other classes to see where they fit in. Now the only “issue” I’ve run into is partly my own fault but it also shows off a strength in my mind. When I started, I decided on the PvP server as my home as I wanted that environment and wasn’t real sure how the PvP-RP servers would differ. What this then allows for is common quest areas in the day-time environment are open combat. As I’ve found already, these can be camped by higher level characters who enjoy killing newbs like me, repeatedly. However, a couple things that I appreciate about how AoC handles this is they do have an instigator flag that will prompt guards to attack said “criminal” to discourage that act somewhat. I will admit that I’m sure that times out after some interval and there are probably ways around it such that it doesn’t really do my – but it seems like this does create some level of punishment that stops some from just randomly killing people. This flag also is pretty obvious such that you can see it from a good distance and have a chance to run if need be. The other aspect is when you die there’s an immunity buff that makes it such that you can’t be harmed while close to the res circle. I realize this isn’t perfect but it at least gives you time to map or log. I’m sure others have a different take on this, but for me it hasn’t bothered me yet as they seem to have more rewards for PvP then penalties for dying. The other game that might fit into this play style for me is Eve which I’ve played a couple of times but never quite got either. It certainly has a lot of the planning and spreadsheet aspects that I like and success isn’t solely driven by how much time you spend in game. Reading Tobold’s latest series of posts as he hops into Eve has brought this back into my thought process and I may have to give that game another go. I’m hoping that I can get a chance to get back to a more dedicated schedule for my gaming, but for now it is what it is and I’m just trying to enjoy it as much as possible. So things have been pretty quiet here for a bit with a combination of work travel and some actual vacation time as well. I have a bunch of things to catch up on and I’ll have a few posts coming out this weekend but I figured I’d update on a few things first. Aside from the travel craziness I have been playing some but just not nearly as much as would warrant writing about. I’ve been working on the Ale Association quests and I’m intrigued by not only the titles but what they might put on that vendor 🙂 This new quest line seems to have drawn some comments from folks that they feel bad doing bad things in the Shire and I’ve actually taken a bit of a different slant on it. I’m looking at it more like a friendly rivalry between two bars (ala Cheers) and the Ale Association is just launching the first line of the pranks 😉 Now if they continue this, I’d love to see the hobbit retaliation! I do like the upcoming changes coming that will put negative reputation for the opposite faction. This makes sense as we’re really not all that sneaky when poking holes in the kegs and stealing recipes 🙂 I am enjoying this festival as they are pretty quick things I can do and I still always enjoy running through the Shire as it is so beautiful and relaxing. In addition to the festival I have been doing some SG and SH runs on my Warden and am one piece away (16 tokens) from the full set such that I can actually run the BG raid. They have made some subtle changes to SG and I like the pace of that dungeon. With a decent group, it is around an hour or so which really isn’t all that bad and you can reasonably do a couple runs in a row. I have my pseudo static group I run with late at night but in addition I really don’t have any issues finding groups (and successful ones too) for both SG and SH. I still haven’t run the other dungeons yet and do want to check them out at some point. I did also run SG on my Captain (only 62) which was quite stressful as I so didn’t want to mess things up for the group. The good news for these runs is that I’ve seen 2 Symbols drop (lost both) so maybe I’m just lucky or maybe they did tweak things a bit. I especially liked the part riding by the Bree festival as you get a good view of the hedge maze! Now the downside to this was I stumbled across a new feature of Fraps in a not-so-good way. With the new “on-demand” recording feature they’ve put the MUST_USE_INDEX flag in the header of the AVI file and unfortunately some tools can’t recognize that flag. And of course, the tool I use Avidemux is one of the tools that has this problem. I do like Avidemux as it is a free open source application that’s not only flexible but intuitive (for me at least) and allows for lots of options in compression in addition to some video editing tools. I posted on the problem on their forums and was expecting a “we’ll get to it in a future release,” but not only did I get quick feedback but a workable solution to the problem! Now granted, it is a bit of a kluge in that I run a “pre-filter” app (that is now my new batch mode too as I routinely hit the 4GB file size cap and need to stitch videos together) that feeds the videos into Avidemux where I can then edit them as I wish. So for me, running at 1440×900 resolution by default Avidemux works great as it allows me to use MPEG4 compression such that I get a reasonable file size with good quality. Certainly Avidemux isn’t the only tool out there, but it is free and works for me 🙂 The Fraps support folks (also incredibly responsive) pointed me to VirtualDub which also looked pretty good and is free as well. However, I didn’t have enough options for compression nor could I get DivX to work for my videos. But it is certainly a simpler process that could potentially work very well depending on your machine setup. The other tool I’ll mention which I found via a twitter recommendation from the folks over at CStM, is AVS which is a collection of a number of video processing packages. I tried this tool out and it looks really slick and incredibly full featured and isn’t terribly expensive at $59. It also has zero problems with the new Fraps format and seems to have all sorts of different compression schemes that worked great for me. At some point down the road if I decide to do something more tricky with videos then I currently do, I may go back and check out AVS but for now I’m happy with my solution and work-flow. Just wanted to put this out there as it caught me off-guard and I had a couple of folks ask about how I did things. So things have been a bit slow on the news side, but hopefully now that PAX is done we may hear some things from Turbine on what all they have planned for us down the road. There were a bunch of folks (including myself) who sent a nice long list of questions to Merric and Goldenstar from CStM and they’re in the process of pulling all the info together. I’m not expecting anything earth shattering after Sapience’s comments on the forums, but we shall see. However, Patience did chime in on a conversation between me and @wickedpt on twitter “@wickedpt Just because we are not talking about something yet doesn’t mean we’re not working on it. Stay tuned. :)” so I suspect they’re just phasing the news updates between DDO and LOTRO. I would expect to start seeing some new diaries and such starting to filter out as we near the end of the Spring festival, although due to the horse issue that might get extended a bit. On Friday I mentioned a new website (well new to me) I stumbled across lotro.mmorsel.com and today’s tip was one I really wanted to stress. The tip is regarding using the fellowship assist options to better coordinate attacks between DPS classes. This has been in the game for a long time for raids, but didn’t come in for fellowships until more recently and many still don’t know it exists. As a tank (and a healer) I can’t stress how important and helpful this setting is when used properly as it makes everyone’s job that much easier. Not only does it provide a way to select the proper target, but it also gives the tank and healer a good gauge on how the fight is progressing without having to switch targets. By focusing all your DPS on one target, not only do they all drop faster but it makes tanking that much easier as you only have 1 mob to compete with DPS on and then you just have to out agro the healer on the rest. Using the fellowship assist not only can you set up the tank’s target and the main target for DPS, but you can also do things like designating targets for crowd control or other such tasks. In groups that I’m not leading, I always make sure that not only is this turned on and used by the leader, but that everyone in the group has it up and knows what to do with it. So if you haven’t used this tool before, next time you’re in a group check it out! This has been a long week not only because of the Spring Festival but for my real life world as well, but I did want to share a couple of links while I’m thinking about them. I also do have some non-LOTRO updates I’ll get out over the weekend but I’m holding off a bit to gather my thoughts better. First up is my shameless plug for my article over on the LOTRO Reporter covering the journey from level 30 to 45. For me, this is where the class really started to get me addicted and wanting more as I just couldn’t believe the things I was able to pull off. I will probably do one or 2 more level pieces before tackling some other topics like raiding, PvP, etc. Feel free to offer suggestions if you have them. Now as many of you have read over the past few days, I’ve been quite enjoying the Spring Festival and have hit most of the quests in the various zones. However, one thing I haven’t done this festival is any of the Inn League pub crawls as I’m already Friend with them and I don’t think there’s a reason to progress any further. However, Duvelmoortgat from the LOTRO forums has a fun idea for mixing the pub crawls with the new Ale Association quests into one big massive drunken adventure through the Shire. I haven’t tried it out yet, but check out the post for all the specifics. I may have to run a normal pub crawl first just to get my bearings straight as I’m not that knowledgeable in the Shire. And finally, I stumbled across the lotro.mmorsel.com website while following the #lotro hash tag on twitter There are some detailed guides up there on the various zones in Middle-Earth, topics like Radiance, leveling guides, crafting, making gold, and many more. I have only looked through some of it, but it looks like quite the resource! If you’re new to LOTRO or haven’t played in a while and want to catch up on all the changes it certainly is worth a few minutes to check that site out. Bah, that would only have been a scratch… come again! I bring terror to the sties of Budgeford, these sties are mine! Ba ha ha ha… fear my wrath, Bolgers of Budgeford. So I put up a few posts, videos, and snapshots yesterday of the festival – if you haven’t seen them check out as I was mainly shrew stomping and enjoying the kegs. Today I wanted to put out a couple of updates and share some posts from others. First up of the links, if you’re unsure of where to go or what all to do check out CStM’s Spring Festival guide as they have pretty much all the info you could need. 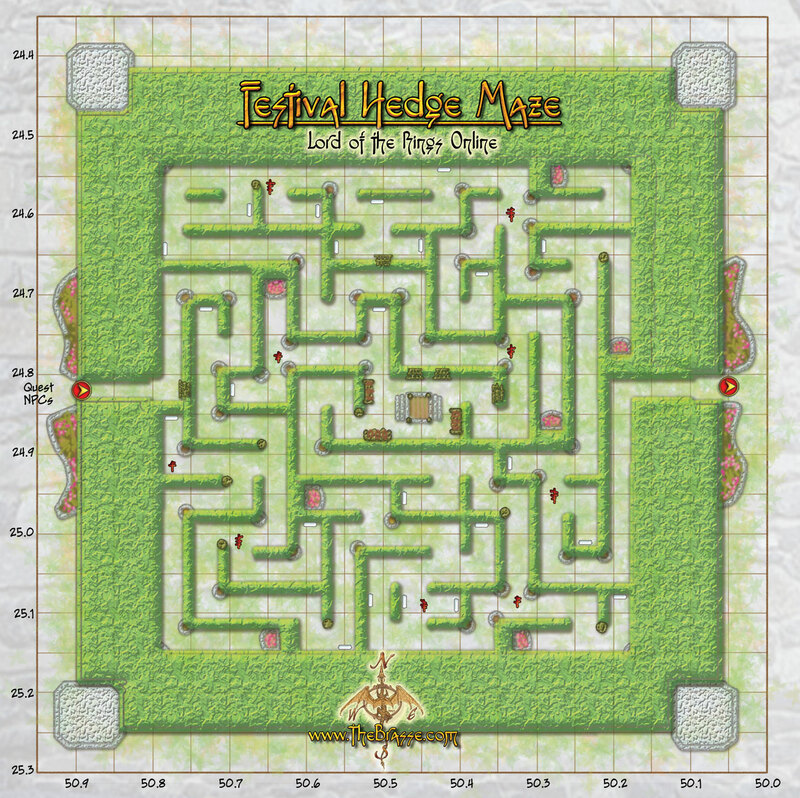 And CStM does post this as well, but the hedge maze map was a HUGE help for me, so if you’re as lost as I was you might want to check it out. Sadly, the festival is not without issues. There are 2 main ones that have been reported. The first is that apparently the new horse is bugged in some way such that they had to remove the vendor, here’s the thread as well as the post from the devs. The other issue is that if you log off during the “Invitation to the spring festival” you will lose the quest as reported by Sapience here. I’d suggest keeping tabs on both threads if you’re still waiting to get your horse. Following on the horse theme if you want to stock up on your leaves and horse tokens but are having issues with the plank jumps in the horse races, check out LOTRO life’s post on completing the races without the jumps. The other post I wanted to mention was a post by Branadoc over on Sneaky hobbits about skirmishes and the festival. I always enjoy reading how others find the festivals and I’m especially interested in how others find skirmishes.